A full-service electrical contractor, Robeck Electrical Edison Lighting in San Marcos, CA is here to address your lighting and electrical needs. For over 42 years, our family owned and operated business, has been serving commercial and industrial properties in North County, and the rest of San Diego County, as well as Orange County, and Riverside County. 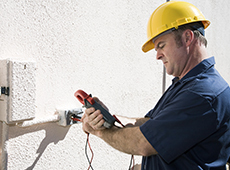 If you need quality electrical services, we are the contractor to turn to. Call us at (760) 744-6880 to schedule a service and our technicians will provide you with the solutions you need. We look forward to serving you!